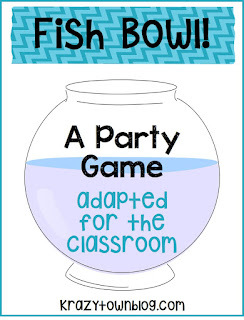 This party game is totally adaptable to the classroom! We hosted some of our good friends for a game night a few weeks ago. We have played Taboo, Loaded Questions, Cards Against Humanity, and some other games in the past, so I wanted to try something new. 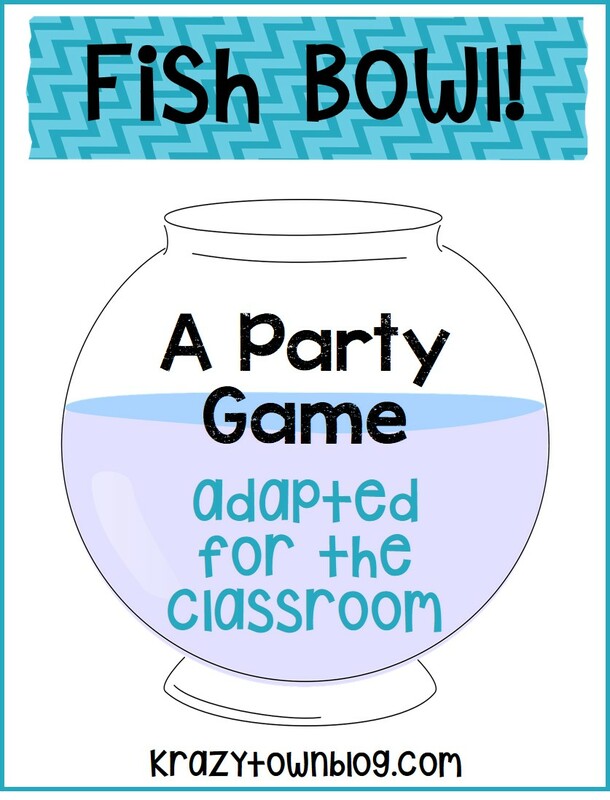 I put my Google skills to work and located a game called Fish Bowl! It was a blast! We started off the evening with food. We set up a make-your-own-chalupa bar and our guests brought an appetizer or a dessert. While we were eating and chatting, I told everyone to take 3 slips of paper I had cut in advance and write the name of a famous person everyone in the room should know on each slip. Then they folded them up and put them in a bowl. When we were ready to play, we divided up into two teams. This game has three rounds. Team A needs to select someone to go first, while Team B needs a volunteer to watch the timer (set at one minute). We used the timer on someone's phone. The person from Team A grabs a piece of paper from the container and tries to have his/her teammates guess the word on the paper using only words and sentences as hints, without using any motions, "sounds like..." hints, or spelling hints. The person tries to have their team guess as many words as they can in one minute. It's important for both teams to pay attention because you need to remember the guessed words/phrases for subsequent rounds. If the team is unable to guess the word/phrase, the person has the option to "pass", put the word/phrase back into the container and continues with a new word/phrase. The person can only pass once during his/her one minute. After one minute, Team A counts the number of successfully guessed words/phrases. Each guessed word/phrase counts as one point. Team B is next, and selects a volunteer from their team to start. A person from Team A will watch the timer, set at one minute. This alternating process continues until all of the words from the container have been used. When the words run out, place all the words/phrases back into the container for the second round. Following the same process as the first round, the next team will select someone to go first, while the other team sets the timer for one minute. However, in this round, the person can use only one word as a hint for their team to guess. The team needs to recall the words/phrases in the previous round. Once all the words in the container run out, place all the words back into the container for the third round. In this final round, the person needs to act and use motions as hints for their team to guess the word/phrase. You are not allowed to speak or make sounds. When all the words run out, tally all the points. The team with the most points wins the game. We had a blast playing the game. Some of the names in the bowl included Kim Kardashian, Hitler, Tim Duncan (plays for our local NBA team, the Spurs), our much-detested former school superintendent, and Albert Einstein. After we finished the game (my team won! ), we talked about ways this game could be played in classrooms. You could use vocabulary words for the words in the bowl. Wouldn't it be fun to play with the names of people you honored during Black History Month? What about science or math concepts? Spelling words? Let me know in the comments if you think of a great way to implement this! I've made a freebie for you with the directions. You can download it here. Have fun! This would be so good during testing season when you've beat the poor dead horse reviewing - this would give you a fresh and fun challenge!